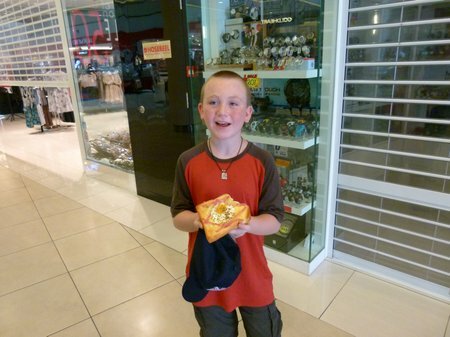 But, my kids loved the profusion of large, western-style malls in this city best of all. They were in boy heaven in the electronics-only Sim Lim Square mall. The next morning, in search of breakfast, we chanced upon a small bakery in a smaller mall near our hostel and found what BigB described as an “all-in-one breakfast pastry”: ham, eggs, bacon and cheese all together on one slice of brioche-style bread. It was a great start to a long day. 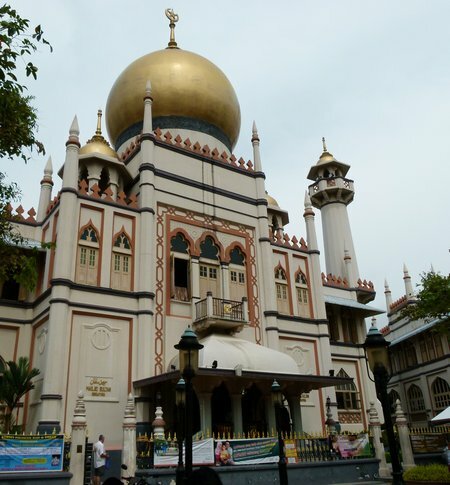 Since we’d spent the previous day in Little India and Chinatown today we headed to Kampong Glam, the traditional Malay and Arab Muslim neighborhood where the Sultan Mosque is located. We wandered along savoring the peace and quiet of the narrow streets with names like Kandahar St and Baghdad St. The muezzin’s call to prayer at noon blended into the background. We made our way to the Malay Heritage Center. This small museum has two floors of exhibits showcasing Malay culture and history starting with sailing and trading along the Malay peninsula through initial settlements in what is now Singapore and negotiations with Stamford Raffles. On the second floor there are examples of Malay costume and dioramas showing traditional housing compared to modern apartments. The museum is a little dry and didn’t hold BigB and CAM’s attention. I went outside with BigB to wait for Murph to finish the tour. Waiting in the courtyard we watched some schoolboys from the associated school play during their lunch-hour. Their modified version of hacky-sack seemed very athletic to us. Most amazing was not only the way they jumped and ran around in the hot, hot sun but also the way they did so without once knocking off their fez-style hats. 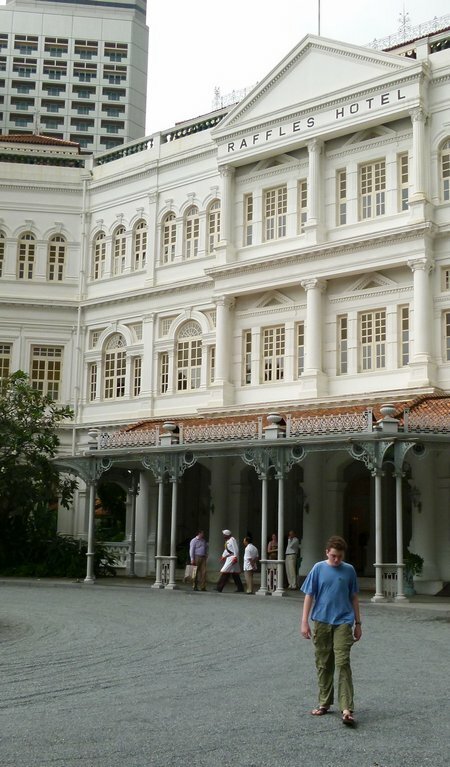 We had just left Raffles when the skies opened in true sub-tropical style. Huddled under an awning in this super-expensive modern part of the city, I pulled out our tourist map looking for somewhere nearby within our price range (i.e. cheap). The Singapore National Museum was a short walk away and we’d passed signs for a Pompeii exhibit earlier in the day. Learning more about Roman history seemed fitting after listening to The History of Rome podcasts while in Argentina. 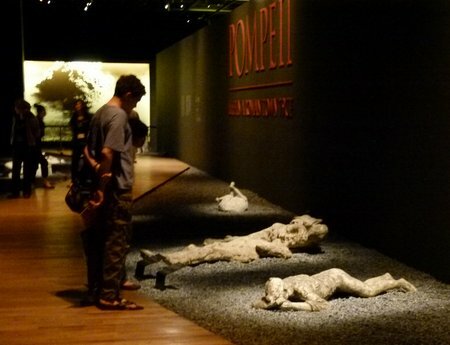 The Pompeii exhibit was excellent and worth checking out if it’s ever in your local museum. Even though the boys howled at the unfairness of it all, after leaving Pompeii I thought we really should check out the Singapore History Gallery. Talk about an unexpected surprise and one which made us disappointed that we’d left this until the end of our visit. We could easily have spent all day here and even my grumpy, reluctant boys were totally engaged in the story-telling approach to this detailed account of the history of Singapore. The multimedia handheld Companion was a big factor but certainly not the only factor in this. The displays are thoughtfully constructed to explain major events and characters from different perspectives in a way which reinforces Singapore’s multiculturalism. The 2,800-square-meter gallery is huge but gets a big “must-see” vote from all of us. We loved the Singapore museum, too. Being from Australia, the section on the fall of Singspore in WWII had a special resonance. If you’re still there, or for any other readers, I’d also recommend the Singapore Science centre, which is very well done, and gave us a full day of looking around and Wild Wild Wet, which is a water fun park (no educational value at all!) but lots of fun for everyone. As far as we could tell we were the only non locals there. Just discovered your website and so glad I did! We are taking our kids to Asia this year for an open ended adventure. Loving your tips! My five year old would be fascinated by the Pompeii display. For some reason he is fascinated with natural disasters! @Jennifer: Thanks for that recommendation. @Amy: glad you found me We’re currently in Thailand, going to Laos on Saturday and so far we’re finding that SE Asia is a fantastic place for family travel. Hey – just read this. Sorry to have missed you when you were here in Singapore. Let me know if you are coming back through at all. Singapore have great museums, traveling there with kids is really worth it.